The creators of the Child-robot with Biomimetic Body, or CB2, say it's slowly developing social skills by interacting with humans and watching their facial expressions, mimicking a mother-baby relationship. A bald, child-like creature dangles its legs from a chair as its shoulders rise and fall with rythmic breathing and its black eyes follow movements across the room. It's not human -- but it is paying attention. Below the soft silicon skin of one of Japan's most sophisticated robots, processors record and evaluate information. 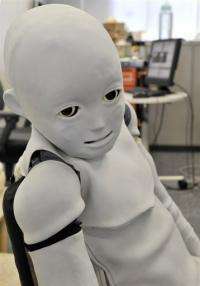 The 130-cm (four-foot, four-inch) humanoid is designed to learn just like a human infant. Asada's project brings together robotics engineers, brain specialists, psychologists and other experts, and is supported by the state-funded Japan Science and Technology Agency. The robot can record emotional expressions using eye-cameras, then memorise and match them with physical sensations, and cluster them on its circuit boards, said Asada. The professor, also a member of the Japanese Society of Baby Science, said his team has made progress on other fronts since first presenting CB2 to the world in 2007. In the two years since then, he said, CB2 has taught itself how to walk with the aid of a human and can now move its body through a room quite smoothly, using 51 "muscles" driven by air pressure. And he hopes that this little CB2 may lead the way into this brave new world, with the goal to have the robo-kid speaking in basic sentences within about two years, matching the intelligence of a two-year-old child. By 2050, Asada wants a robotic team of football players to be able take on the human World Cup champions -- and win. Welcome to the cutting edge of robotics and artificial intelligence. Researchers across Japan have unveiled increasingly sophisticated robots with different functions -- including a talking office receptionist, a security guard and even a primary school teacher. Its makers at the National Institute of Advanced Industrial Science and Technology outside Tokyo plan to sell the 158-centimetre fashion-bots for around 200,000 dollars each. Thousands of humanoids could be working alongside humans in a decade or so, if that is what society wants, said Fumio Miyazaki, engineering science professor at the Toyonaka Campus of Osaka University. If the world is ready for a functioning robot secretary, for example, there is "no need for a major technical breakthrough," he said. A Tokyo subsidiary of Hello Kitty maker Sanrio, Kokoro -- which means heart or mind in Japanese -- has also produced advanced talking, life-size humanoids. "Robots have hearts," said Kokoro planning department manager Yuko Yokota. "They don't look human unless we put souls in them. "When manufacturing a robot, there comes a moment when light flickers in its eyes. That's when we know our work is done." Public opinion in Japan may be more open to robots than in the West, where dark science fiction visions from movies such as "Bladerunner" and "Terminator" have conjured images of robo-soldiers taking over the world. Thanks to such benign cartoon characters as Astro Boy, "Japanese people have a friendly image towards robots," said Toshiba's Yoshimi. Asada said Japan's indigenous animistic belief system may also have readied people to accept human-like robots with minds of their own. "Everything has a mind -- the mind of the lamp, the mind of the chair, the soul of the desk," he said, pointing at objects in his office. "Therefore the machines should have their mind too. If we proceed in this study, machines may have something like a human mind or 'robo-mind'," he said. What in the world is up with Japanese people and their fetish for humanoid robots? They have them on TV, in their manga, in practically all their media. It's just weird. I hope they'll invent more adult version before the uprise. I don't wanna be killed by a child robot -> uncool. smartk8 -- The japanese government is dead set on getting a robot in every japanese household in 6 year`s time.. check this story out. 300 years?? ARE YOU JOKING ME??? ...it took us about 60 years to master flight, and the intervals between breakthroughs was decreasing with each one. But let`s look at something else, shall we? You still think itll be 300 years? zbarlici: Well it depends on the definition of the word "robot" I guess. We've different versions of a kitchen robot for more than thirty years but that's not what you've in mind I guess. An enhanced version of the ASIMO robot is not a robot for me either. I meant either one with sofisticated A.I. or at least one which is reliable enough. In a sense even the kids can be left alone without parents being stressed about it when away from a home. I don't count the clumsy toys which need to be checked all the time even when performing the simplest tasks. I still hope but I'm trying to be realistic. Ok, let's make it 150 years :D.
zbarlici is right 15 years or even less. Too much financial incentive besides just the home domestic market. Imagine what will happen to all those sweatshops in Asia and else where when a robot can take the place of a human. You can treat them anyway you like and no human right violations. 24 hour day? No problem. That will free us all from menial activities for higher pursuits. Like, well... hum... maybe commenting on Physorg articles? Oh my God. It will be chaos. Confusion about identities. We don't need to handle that. Doggonit: I'll agree that 15 years till robots are on the market is a resonable time frame, but I imagine that it will be in the same boat as say space tourism is on the market right now. It will still take a little more time for the technology to trickle down to you and I. But I don't see the robot sweatshops anytime soon. Why pay $$$ for a mechanical human when you can spend pennies a day for a whole room of children. If robot labor was so cheap, 'slave' labor would already be a thing of the past. You don't need to think like a human to do menial tasks as a robot and there are plenty of robots out there that can sew buttons and make cheaply made clothes that end up on american store shelves. Though when the utopian day does come along, what will happen to all of those people who have the free time for higher pursuits. I dare say it won't be pretty. Not condoning the human rights violations of that business, but idol hands make...riots and angry mobs and all sorts of fodder for the nightly news. I think the anthropomorphism of robots is the (usually?) platonic equivalent of a blow-up doll. No matter how realitic they might become, they would never feel like there is someone there. So why go so furvently down that road? The notion of the robots having a soul is rediculous and repugnant. I think there is a real danger that robot 'companions' could result in some people de-valuing actual human interaction, and even human life itself. I'm not worried about fanciful skynet scenarios. But I think there are real social implications that are not being fully considered. On a related subject, true AI is still entirely hypothetical. We cant really predict if or when it might be developed. There are several valid reasons AI would and should never be given the status of 'life'. I wont go into them all now, but one example is that AI wouldnt be unique and could be readily replaced with an exact copy. An even further leap is needed to speculate about AI emotions. I consider true self-awareness to not exist without the 'organically derived', non-preprogrammed emotions and reactions that 'naturally' accompany it. To simply conclude that you exist is not self-awareness in any meaningful sense. Life does not need to be 'unique'. There are many plants and animals (and more, if you get microscopic and such) that reproduce asexually, which does not create a very unique offspring. Starfish and hydra are interesting as well, being able to regrow limbs or even a whole other body (thus becoming two creatures) if cut apart. And what of cloning? Clones are certainly alive, but they are not unique in a way that can be measured biologically (other than age in some cases). As for being 'organically derived'... are we not organic? And wouldn't A.I. be derived from us (from our imaginations, and our physical construction efforts)? And from many of the same elements as we are? They would not be "life as we know it", but I can not dismiss that they would have a very real potential to be 'life'. "No matter how realistic they might become, they would never feel like there is someone there"
Do you own a pet? Dogs and cats are definitely alive, and most pet owners seem to attribute all kinds of human-like personality traits and expressions to their animals. My dog is definitely 'there'. As is my cat, but he's a slutty punk. "I think there is a real danger that robot 'companions' could result in some people de-valuing actual human interaction, and even human life itself." Or, perhaps coming to the realization that life is a diverse and wonderful thing, we would all embrace the beauty and value of all living things, of flesh, or metal, or whatever it be made of, no matter shape or size. ...i mean just look at that robot kiddie face. Could you resist it if you saw it sitting on the shelf at Home Depot? Heck no! Rent it PUT IT TO WORK, DAG NAMMIT! so Robot labor IS DA BOMB!!! Just look at that kiddie robot face, could you resist it if you saw it on the tool shelf at the home depot? HECK NO, rent it PUT IT TO WORK, Dag-Nammit! Mimicking human intelligence requires a MINIMUM of two interlocking Software systems that work off of each other. One is the autonomous physical system that receives 'information' on it's choice outcome by the conscious mind and then the conscious mind that receives information on it's choices via observation AND the colouration (rose coloured glasses overlay) brought into the equation by the autonomous system's results, ie desire vs survival. It's bit more complicated than that simplistic answer but that is the key to creating 'human like' intelligence in robotic systems. Desire vs self preservation, vs the basics of social design on the conscious mind. Add in the self correcting model of the guy who makes software that is creating itself as it is killing itself..then you have something QUITE similar to the human function, with regards to the multi-layered system that it is. At first, the autonomous results inform the conscious and begin it's shape, thus the rose colour glasses effect on the conscious mind. As the conscious mind grows in it's database/computational possibilities and knowledge of results, it has a greater effect on the decisions of the autonomous system..and then the conscious mind hopefully takes over but in the end..in most people..it shares control, at best. If a modeling and operative learning system of similar nature is created for android forms, then it should do very well in the mimicking of humans.